According to Apple, its App Nap advanced technology feature in Mavericks helps you save power when you’re working with more than one app at a time. The system knows when a certain app is in the background, completely hidden by other apps’ windows. When that app isn’t doing anything, then, OS X will slow the app down, keeping it from using up CPU cycles, and thus battery power. It’s a great feature, and one of the reasons why your Macbook may seem to have more battery life than it used to, thanks to Mavericks. When switching to a napping app, it can seem to take a couple of seconds for OS X to get that app back up to speed. If you want to reduce the start up time of a napped app, you can disable App Nap for it. 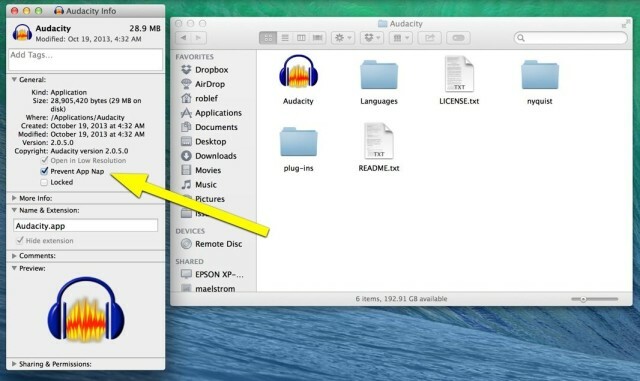 Head into the Finder and find the app you want to disable App Nap for. Right click on the app (or Control-click) to bring up the contextual menu, and choose Get Info. You can also just left click on the app and hit Command-I on your keyboard. Either way, the Get Info dialog box will show up. Look about halfway down the window, and find the Prevent App Nap checkbox. Checking that will keep OS X from slowing the app down when it’s hidden in the background. When you switch to a non-napping app, you may notice a slight faster response time. You may also see a slight decrease in battery performance if you disable App Nap for many apps that you’re running, so use this function sparingly.